Correspondence between the Poor Law Commission/Board and union officials. Part of the correspondence for more than twenty unions (Axminster, Basford, Berwick upon Tweed, Bishop's Stortford, Blything, Bromsgrove, Cardiff, Clutton, Keighley, Kidderminster, Liverpool, Llanfyllin, Mansfield, Mitford & Launditch, Newcastle under Lyme, Newport Pagnell, Reeth, Rye, Southampton, Southwell, Truro, Tynemouth, Wolstanton & Burslem) is now searchable online on the TNA website with an accompanying guide available from The British Association for Local History. Large-scale workhouse architectural plans from 1861-1918. These items (81 large boxes) are not individually catalogued, however. 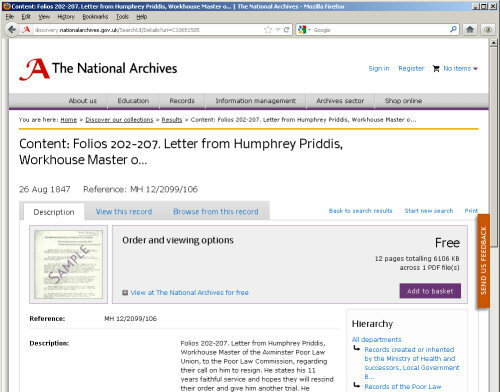 A sample record of the TNA's digitised poor law union correspondence. Images of the original documents can be also be viewed or downloaded. Most poor-law material is filed under the MH (Ministry of Health) sections of the TNA catalogue. There is an online guide to the types of material included under the various MH sub-sections. The TNA catalogue can be searched online, although you need to visit the TNA to actually see any of the documents (other than the above-mentioned correspondence). The Hospital Records database which contains information relating to the availability of records for around 3,000 hospitals, many of which began life as workhouses. The National Archives' Discovery database — a searchable catalogue of a large number of English archives. A search for a phrase such as "Dover Poor Law Union" (with quote marks included) will often locate any relevant workhouse records.